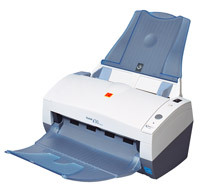 The Kodak i30 and i40 document scanners provide exceptional image quality, productivity and ease of use. The scanners are aimed at a wide range of businesses from small offices to large organisations with the need to scan documents within a document management solution. Kodak has included optical character recognition software and software for scanning directly to searchable PDF (Acrobat) files, enabling users to search for textual information in the scanned documents. KODAK i30 and i40 scanners fit easily on every desktop, in front- or back office. Ease of use is a key benefit of these scanners. Inexperienced or infrequent users will find the scanner very easy to operate, as with all Kodak scanners. Kodak i30 and i40 scanners offer easy setup and integration, fast scanning speed and a USB 2.0 interface for quick image transfer. The new KODAK i30 and i40 Scanners features the advanced integrated Kodak Perfect Page Scanning image processing technology. Perfect Page Scanning includes state-of-the-art features, which allow scanning documents of different sizes, orientations, contrasts and colours automatically. Even the most challenging and mixed documents are scanned without the need to change the scanner settings. Professional-level bundled software offers features that maximise the value delivered from the i30 and i40 models right out of the box. KODAK Capture Software, Lite, a powerful capture client for workgroup applications. ReadIRIS Pro Corporate Edition V8 provides office productivity such as optical character recognition and scanning directly to searchable PDF files, enabling the user to search, copy and paste textual information from scanned documents. PDF files, the most common format for electronic document distribution, can be shared over the network or uploaded to a Website. The KODAK i30 Scanner supports high scanning speeds of 25pages per minute in mono and full colour (at 200dpi single sided) while the KODAK i40 Scanner allows scanning of both sides of a document simultaneously (duplex) with up to 50ipm in mono and colour. An automatic document feeder with a capacity of up to 50 A4 sheets prevents jamming, and feeds smoothly a wide variety of documents with different qualities and sizes. Features include paper size detection, de-skew, cropping, multi feed detection and intelligent thresholding are standard and fully automatic. A unique special document feeder on the i40 model allows front-feed, front-return scanning of small documents such as drivers’ licenses and insurance cards. Flexible electronic colour dropout automatically suppresses non-critical red, green or blue background to improve forms processing.